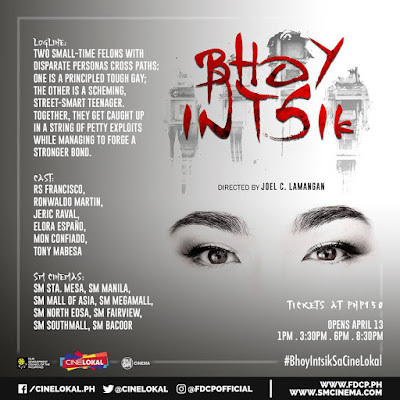 This is followed by Bhoy Intsik directed by Joel Lamangan, a Sinag Maynila Independent Film Festival 2017 Finalist which won the Sinag Box Office Award. This is featuring RS Francisco, Ronwaldo Martin, Jeric Raval, Elora Espano, Mon Confiado and Tony Mabesa. The film is about two small-time felons with disparate personas cross paths: One is a principled tough gay; the other is a scheming, street-smart teenager. Together, they get caught up in a string of petty exploits while managing to forge a stronger bond. The final lined up film this April is a sci-fi film Throwback Today directed by Joseph Teoxon starring Carlo Aquino, Annicka Dolonuis, Kat Galang, Benj Manalo and Empress Schuck. The film is about Primo, gifted with a good eye for production design, who ventures into the working world with a great desire to succeed. Unprepared for the harsh realities of the real world, Primo experienced failure, heartbreak and regret in a series of unfortunate events. Life didn’t turn out as he had expected: He wasted away, wallowing in grief, and jumped from one odd job to another for more than a decade. While trying to make ends meet at the peak of his misfortunes, he experiences a technological glitch with his old desktop computer and gets a chance to re-write his life.